Masses of pink spring cherry blossom to add colour to your garden. Grown for its gorgeous, springtime displays, 'Rosemund’ offers interest all year, making it a great choice for small gardens. The double, bowl-shaped pink blossom is a picture in early spring, filling the air with perfume. Red fruits for wild birds to feast on arrive in late summer, but the colour changing foliage looks great throughout, culminating in a riot of autumnal bronze. Easy to grow and totally hardy. Supplied as an established plant in a 2L pot ready to plant straight out. There's nothing more exciting in spring than watching a cherry tree burst into bloom, and this beautiful specimen cherry is no exception. Grown for its gorgeous, springtime displays, the flowering patio cherry Prunus triloba 'Rosemund' gives unparalleled interest all year, making it one of the best choices for small gardens. Also known as the flowering almond, 'Rosemund' becomes smothered in double, bowl-shaped pink blossom around April time. These glorious rose-pink flowers erupt along the dark, bare branches, creating an absolutely stunning spectacle and filling the air with perfume before the green leaves appear. The branches make excellent cut flowers too if you can bear to trim them off – simply bring them into your home when in bud, and the warmth will force them into bloom early. The voluminous blossom is followed by bright red fruits which are a magnet for wild birds in late summer, while the colour-changing foliage looks great throughout, concluding with a riot of autumnal bronze. Growing to around 3m x 3m maximum when in the ground, ‘Rosemund’ is tolerant of pruning if needed, whether you need to restrict its size for growing in a large pot, or to encourage more prolific blooms. That said, pruning is not necessary to maintain the shape of this cherry which forms a loose vase-shaped canopy - just snip off any wayward or damaged branches. 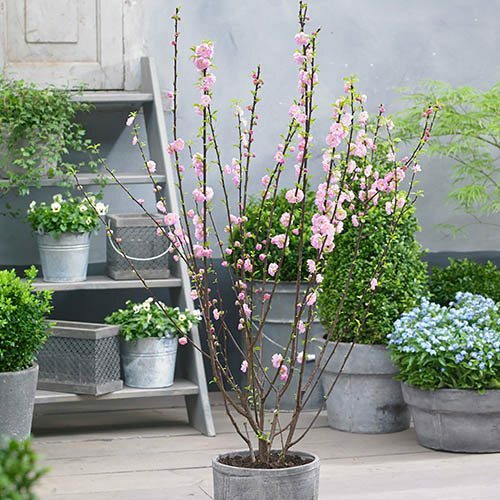 Easy-to-grow, compact and totally hardy, your plant is sent as an established plant in a 2L pot ready for planting out or potting on - so anyone can grow their own flowering cherry in any garden, on the patio, decking or balcony. Supplied as an established plant in a 2L pot ready to be potted on or planted out. Prune old flowering shoots immediately after flowering. If planting in a large pot, use a good quality, soil-based compost.